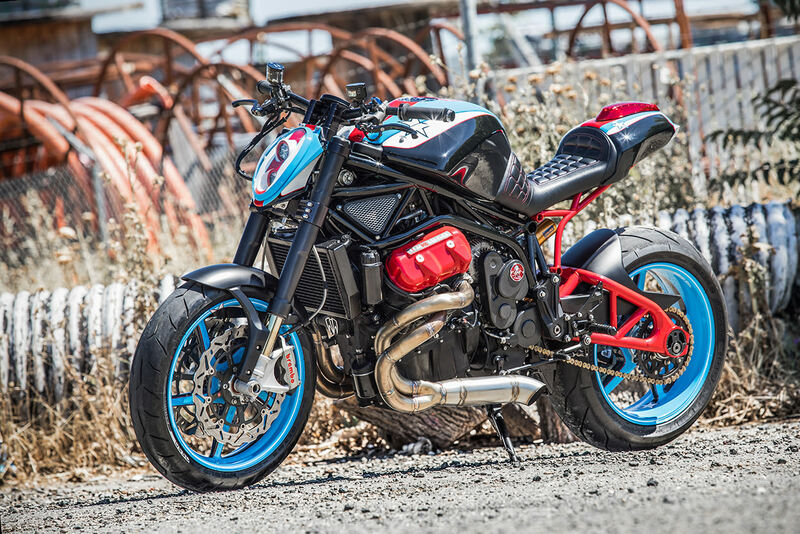 Motus pushed all the boundaries when they released their MST concept in 2011. It took 5 years but when the production bike hit the streets it was well worth the wait. Now we are finally starting to see a crop of custom MST’s coming out of the woodwork and it couldn’t make us happier. The American based company broke all the rules when building the MST, so much so that it almost didn’t have a category to associate with. Eventually, it came to be called a sports tourer, but with a little bit of muscle thrown in the mix. The key feature to Motus’s madness is their patented V4 engine. The ‘baby block’ as it’s often referred to is a 1600cc single cam pushrod V4 that is mounted longitudinally in the frame. 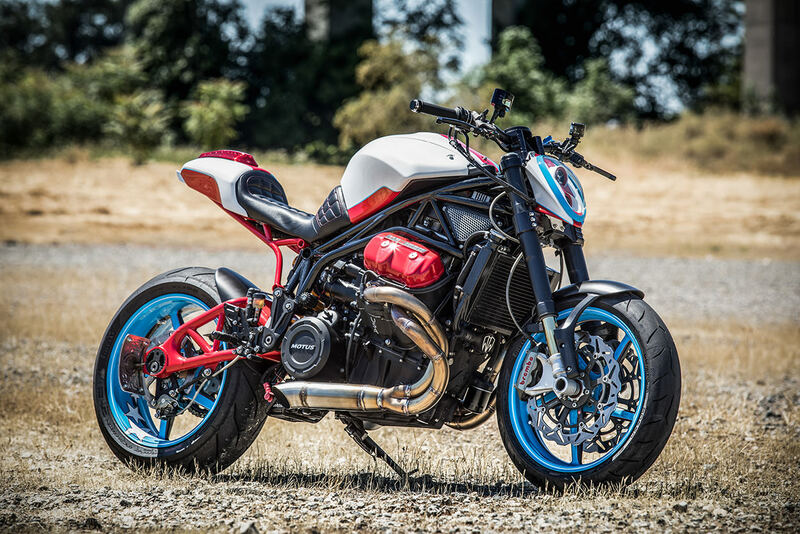 Its design, while completely one-off by Motus, resembles that of a Chevy small block. It doesn’t get more American than that. It also produces the kind of power only an American would truly appreciate, good horsepower with unreal amounts of torque. That means the MST can muster 123ft-lbs and 165 horsepower without breaking a sweat, with an exhaust note that can rival any American muscle. For most, the rest of the bike is hit or miss. It’s a big machine, which is great for touring, but at 585lbs the MST is no spring chicken, yet it handles that heft well thanks to Öhlins NIX30 front forks and adjustable rear shock. The seating position is typical for the touring class, and the long swept back bars help keep the rider upright. It all fits, making it a comfortable yet fun motorcycle thanks to that supreme V4. Bryan Fuller of ‘Fuller Moto’ liked it, but openly wondered what that V4 was capable of if it didn’t have to haul around all that touring gear. 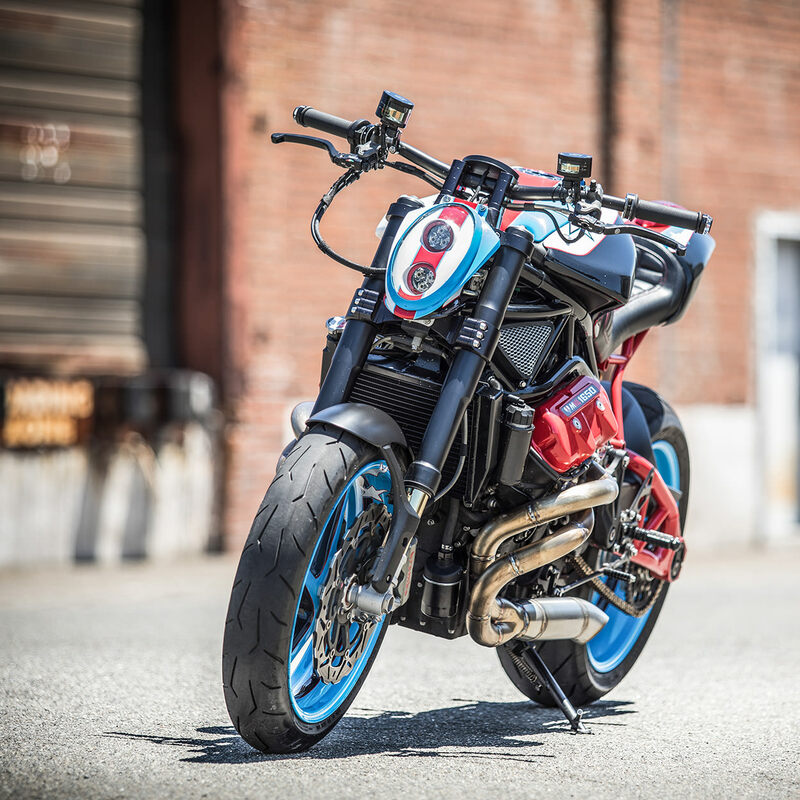 This is how we ended up with the Moto X Motus MST-R.
To start the project Bryan landed with the factory hopped up option, the MST-R. This gives the Motus V4 20 more horsepower and 3 more torque, all while dropping the wet weight down 20lbs. Already off to a good start. Bryan is no stranger to hot rodding American machines, but this would be his first venture with Motus. 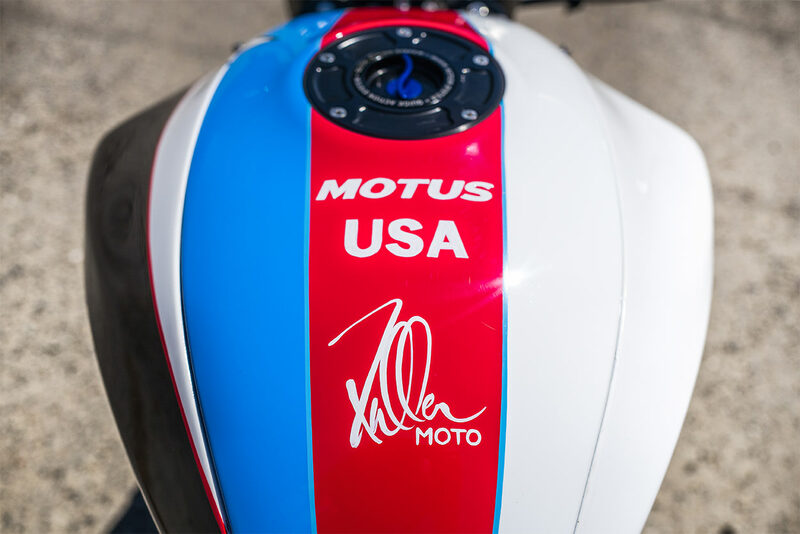 The companies worked in conjunction on this project, allowing Motus to provide technical guidance without impeding on the creative process they had entrusted Fuller Moto with. 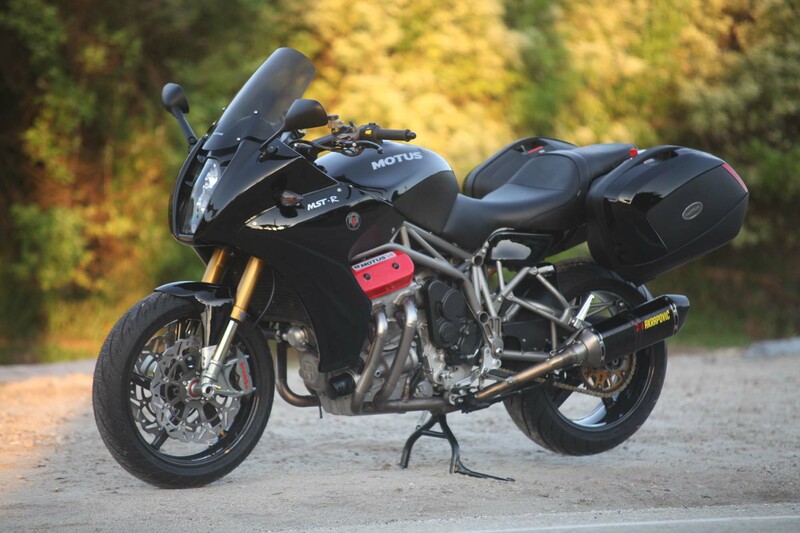 The bike is a customer-owned 2015 Motus, kindly donated to the cause. In a strange turn of events the MST-R was damaged in shipping, wrecking all the bodywork. The crew used this as an opportunity, coming up with the idea of a completely naked design. With the bodywork removed the Fuller crew got to work on the aesthetics for newly naked MST-R. First came the headlight. Keeping true to his hot rod roots, Bryan elected to build the housing from aluminum instead of a plastic or carbon alternative. Once shaped it was then fitted with LED’s from The RetroFit, and finished off with a clear cover fashioned from a helmet visor. The next step was to ditch the subframe and start from scratch. In place of the luggage carrier now sits a short narrow tail section fashioned from .065 Chromoly tubing and sheet aluminum. 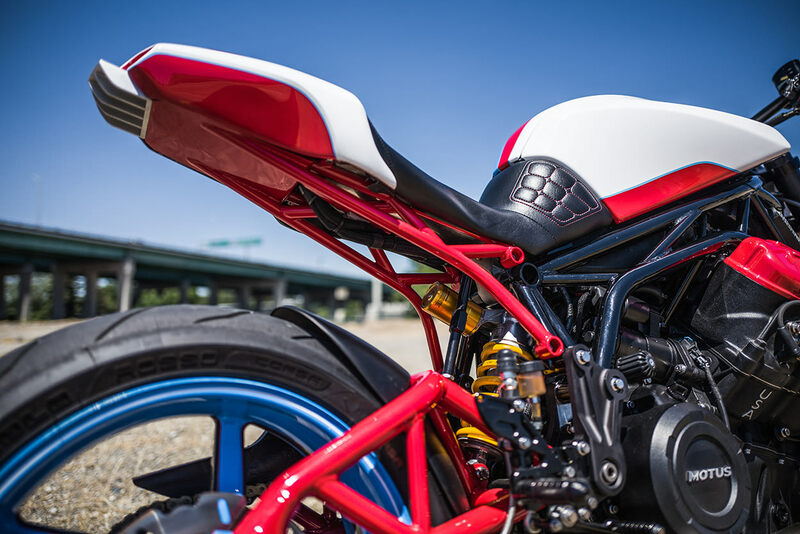 The tail section is anything but usual, featuring a tail light that sits on top of the tail section while a small Motus imprinted diffuser lies out back. It’s perfectly sized to match the new naked looks, sitting just short enough without being a stubby eye-sore. Motus had already provided enough performance, so Bryan focused the majority of his efforts on the aesthetic, but he wouldn’t be where he is today though if he didn’t fiddle with the go-fast parts at least a little bit. Now the MST-R has a new set of custom welded 2-into-1 exhaust, one on each side. Paired with a new air element the MST-R was able to throw down a brilliant 156 horsepower, putting this Motus right on par with its claimed 180 crank hp. To compliment that, the modifications that Bryan has now done give the MST-R a new wet weight of just 435lbs. That’s 130lbs lighter than the sport tourer this bike used to be, making it absurdly fast. Because the MST-R has gotten so much lighter they had to change both the ride height and spring rates front and rear. The MST-R already comes with top of the line Öhlins components, so it only took a setup to make the bike handle like a champ. 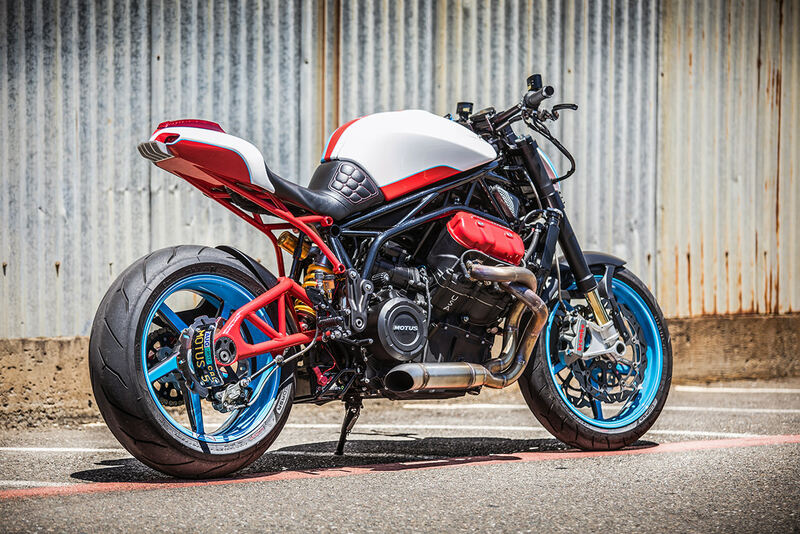 Because of its newfound aggressive nature, the MST-R’s carbon BST wheels were wrapped in Pirelli Diablo Rosso Corsas, some of the very best performance street tires currently on the market. The wiring harness on the Motus had to be overhauled, reducing clutter and weight. To continue their minimalist design, Fuller elected to use a Motogadget Motoscope Pro gauge cluster to display the important info. They also re-worked the handlebars and added mini toggles in place of the stock switches. To put a stamp on the final product Bryan designed an asymmetrical paint scheme that sets off the entire build. The MST-R is now flowing in red white and blue, with a handful of starts sprinkled throughout. It now screams America from both its looks and its exhaust note. The standard Motus MST-R is a great machine, but this is proof that they need to offer something other than a standard sport tourer. We all know that the stock MST-R can hit 168mph on the salt flats, a world record btw, so we can only imagine what dropping 130hp could do for that kind of speed. 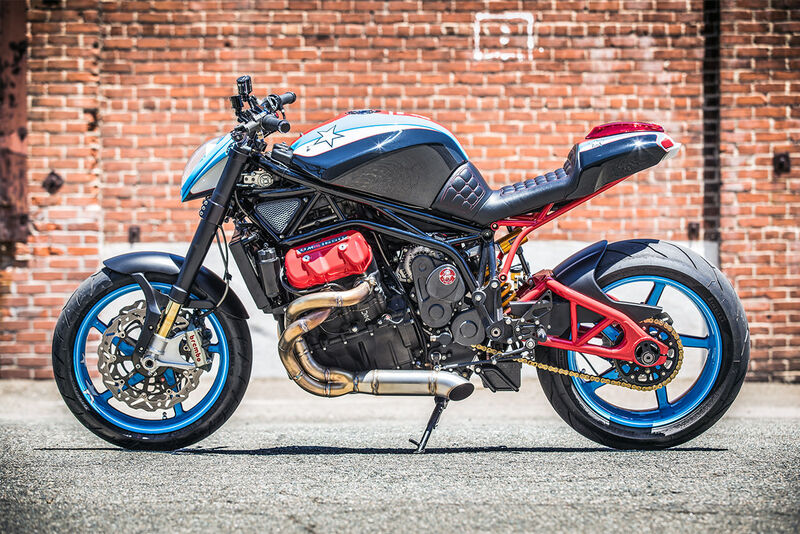 Please Motus, give us a naked bike that’s even half this cool, we promise to ride the hell out of it.